The chairman of KB Financial Group Inc. apologized on Friday for being embroiled in allegations of hiring irregularities at the financial group's flagship bank. 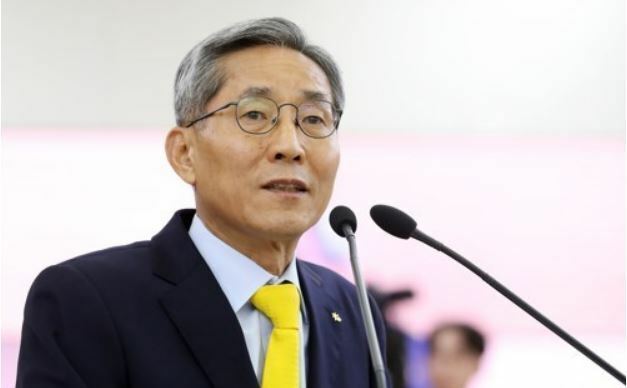 Police raided the homes and offices of KB Financial's senior executives, including Chairman Yoon Jong-kyoo, earlier this month over hiring irregularities at Kookmin Bank. Yoon's grandniece has been reportedly suspected of being hired at the bank in 2015 after receiving a special favor. "I am really shameful and sorry that I am drawn into a whirlpool of controversy on hiring corruption," Yoon said at the financial group's annual shareholders' meeting. Yoon said he will fully explain his stance about the allegations to the police. South Korea's public firms and financial industry have been criticized for hiring people connected to people in power or business leaders amid high unemployment for young people.